Obama did do something of potentially great significance today: open the door for Congress to make the big changes that he won’t. 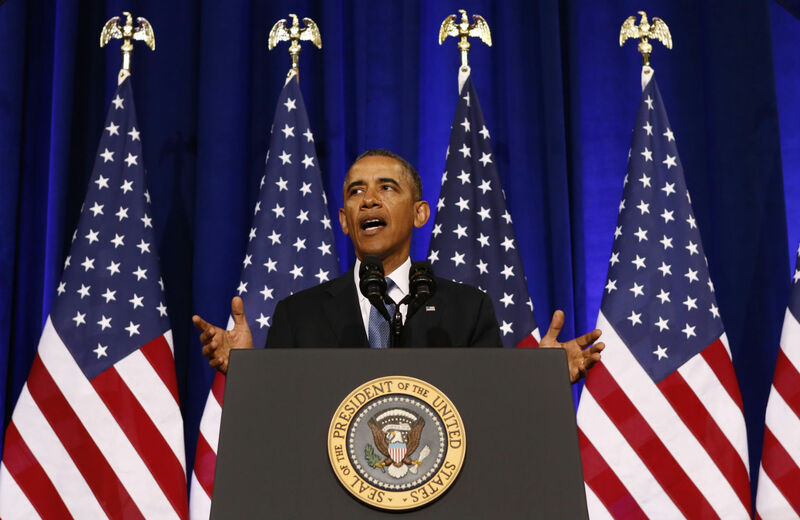 US President Barack Obama speaks about the National Security Agency from the Justice Department in Washington January 17, 2014 (Reuters/Kevin Lamarque). At the dawn of our Republic, a small, secret surveillance committee borne out of the ‘The Sons of Liberty’ was established in Boston. The group’s members included Paul Revere, and at night they would patrol the streets, reporting back any signs that the British were preparing raids against America’s early Patriots. Throughout American history, intelligence has helped secure our country and our freedoms. The choice to begin the speech with an homage to spying—however noble—reflects the practical decision that the president announced: to embrace much of the surveillance activity conducted in the name of national security, while accepting a series of modest reforms that civil liberties advocates greeted as but a first step to curbing the National Security Agency. The reforms that will likely get the most attention affect the telephone metadata program, which is authorized under section 215 of the Patriot Act. The president said he will end this program “as it currently exists,” by giving the intelligence community two months to develop “alternative approaches” that nevertheless preserve the metadata dragnet. He ordered more immediate constraints on the call records program, too. The FISA court must now approve every query, and analysts will only be able to trace numbers two “hops” from an initial suspect, instead of three. The program grew out of a desire to address a gap identified after 9/11. One of the 9/11 hijackers—Khalid al-Mihdhar—made a phone call from San Diego to a known al Qaeda safe-house in Yemen. NSA saw that call, but could not see that it was coming from an individual already in the United States. The telephone metadata program under Section 215 was designed to map the communications of terrorists, so we can see who they may be in contact with as quickly as possible. In fact, we know that al-Mihdar could have been located well before 9/11. The problem wasn’t a lack of information—it was the fact that intelligence agencies failed to share information with one another. Obama made a few important acknowledgements of the potential for abuse inherent in surveillance programs, but he painted a seriously misleading picture of the NSA’s recent history when he said that he’s learned nothing that “indicated that our intelligence community has sought to violate the law or is cavalier about the civil liberties of their fellow citizens.” In 2009, the FISA court argued that the privacy protocols set for the phone records program had been “so frequently and systematically violated that it can fairly be said that this critical element of the overall…regime has never functioned effectively.” In 2011, the chief judge of the FISA court found that the NSA had, for three years, operated in violation of the Constitution by gathering and searching the contents of tens of thousands of Internet communications sent by Americans, and had repeatedly misled the court about its activities. NSA employees have used surveillance programs to spy on their spouses and exes. It is not surprising that the president chose to defend rather than challenge the intelligence establishment. He has done so consistently since the first of the Snowden documents came out. Much of what he outlined today are not specific reforms, and instead directives for transparency; assurances to foreigners that they will not be spied on; and further reviews, notably a broad consideration of big data and privacy to be led by adviser John Podesta. Obama did do something of potentially great significance today: open the door for others to make the big changes that he won’t. That task now rests with Congress. Obama requested that lawmakers engage on several fronts, most critically in creating an independent panel of privacy and technology experts to inform decisions made by the FISA court, and to consider whether there should be judicial review before the FBI can issue National Security Letters to obtain communication and financial records from business. And many of the most vocal privacy advocates from both parties in Congress have made it clear that they will not stop there. If Obama’s speech is a first step, it’s worth thinking about what forced him to make it, beyond the obvious (Edward Snowden). According to reports, it was not so much the programs revealed by Snowden that shocked the president but instead the public outcry that followed. It’s going take a lot more of the same to move the heavy feet of government further.